Located in the Midwest region of the United States, Kansas is the 15th biggest state in terms of area and 35th largest in terms of population, making it one of the most sparsely populated states. It covers an area of 82,278 square miles and has an estimated population of 2.9 million. Kansas is located in a central location of the United States, being equidistant from the east and west coasts, and was named after the Native American Kansa tribe that lived in the area before white European settlers arrived. The first European settlements were formed in Kansas in 1812, but the state developed rapidly, especially after the Civil War. Kansas has borders with Nebraska, Missouri, Colorado, and Oklahoma. Nicknamed 'The Sunflower State' and 'The Wheat State', Kansas landscapes are mostly made up of prairies that have been turned into farmland. Agriculture has historically been a huge part of Kansas' economy and continues to be important in the modern era. The capital city of Kansas is Topeka, but the state's biggest city is Wichita. The largest metropolitan area in Kansas is the Kansas City metro. Here are some additional details and statistics for the largest cities in Kansas. Situated in Sedgwick County in the south-central part of the state, Wichita is the biggest city in Kansas. 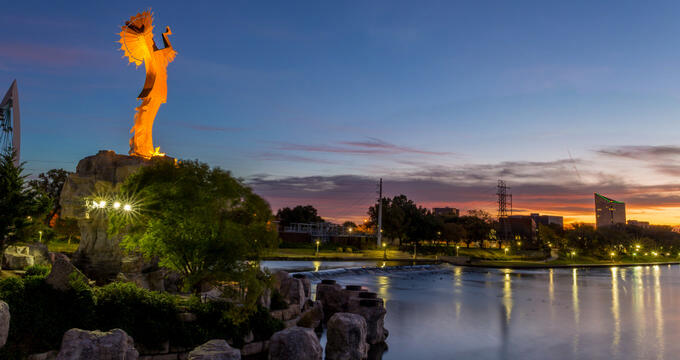 Founded in 1868 and incorporated in 1870, Wichita covers an area of 163.59 square miles and an estimated population of 390,000 people, with over 640,000 in the surrounding metropolitan area. The city started off as a simple trading post and was known as 'Cowtown' due to the presence of many cattle ranchers passing through on a regular basis. In the early 20th century, Wichita began to develop and expand with the arrivals of new businesses, especially in the sector of aircraft production. The city is also home to the biggest airport of Kansas and is one of the most-visited cities in the state. Located in Johnson County, Overland Park is the second biggest city in the state of Kansas. It is located in the eastern part of the state and is actually a suburb of Kansas City, Missouri. Overland Park covers an area of 75.6 square miles and has an estimated population of 188,000. The city was established in the early 20th century and incorporated as a first-class city in 1960. The main contributors to Overland Park's economy are retail, health care, finance, insurance, and the service sector, and the biggest employer in the city is Sprint, the popular telecommunications company. Overland Park Arboretum and Botanical Gardens is one of the most-visited attractions in the city. Often abbreviated to KCK in order to distinguish it from the identically named Kansas City of Missouri, Kansas City is the third biggest city in Kansas. This city is the county seat of Wyandotte County and is located in the northeastern section of Kansas. Kansas City covers an area of 128.38 square miles and has an estimated population of 151,000. Kansas City was constructed at the meeting point of the Kansas River and Missouri River. It is part of the Kansas City metropolitan area, which also includes the Kansas City of Missouri. Healthcare is a big part of Kansas City's economy, with the University of Kansas Hospital and Medical Center being the biggest employers in the city. Situated in Johnson County in the northeastern part of the state, Olathe is the fourth biggest city in Kansas. This city is located in the Kansas City metropolitan area and is in close proximity to Overland Park. Olathe covers an area of 60.42 square miles and has an estimated population of 135,000. The city was founded in 1857 and its name allegedly came from a Native American word meaning 'beautiful'. Many major industrials parks can be found in Olathe, with a lot of businesses choosing to set-up locations in this large Kansas City. The capital city of Kansas, Topeka is the fifth biggest city and one of only five cities to have a population exceeding 100,000. Topeka is located in Shawnee County on the Kansas River, in the northeastern part of the state. The name of this city comes from a Native Dhegihan language phrase meaning "Place to dig potatoes". Topeka covers an area 61.47 square miles and has an estimated population of 126,000, with around 233,000 in the surrounding metropolitan area, which includes Jackson, Jefferson, Wabaunsee, and Osage Counties. As Topeka is the state capital, it's an important cultural and commercial hub for Kansas, with the State of Kansas being the city's main employer.